I played a LittleBigPlanet 2 basketball game with Media Molecule co-founder Alex Evans today, then watched someone else control multiple Sackbots in a puzzle game. Both were very different from LittleBigPlanet's platforming sections. Neither was as cool as the racing game Evans demonstrated. The racing game itself, which saw a Sackboy ride on a fuzzy caterpillar-like beast, wasn't particularly spectacular looking. Sackboy simply had to avoid fiery obstacles and roadblocks. It was how that racing game was built, using LittleBigPlanet 2's new music sequencer and synth tool, that was so unexpected. Yes, someone made a song that turned into a race track. And it turns out that music sequencing in LittleBigPlanet 2 will enable creators to do much more than that. For the purposes of building a race track, the sequencer tool makes a lot of sense. The top-down racetrack consisted of a starting point connected to the rest of the level, then a bunch of track sections that were built further away, floating in empty space. Those racetrack sections were essentially samples, speaking in music sequencer terms. As the timeline on the music sequencer moved forward, those racetrack samples transitioned from one to the next, making a complete, playable course. Evans showed us the racetrack's timeline, which looked like note chart of increasing and decreasing track section difficulties. Anyone who's ever used a sequencer or timeline in, say FruityLoops, GarageBand, Flash or Adobe Premiere, should feel comfortable with using a tool like this to create levels, cinematics or racetracks. 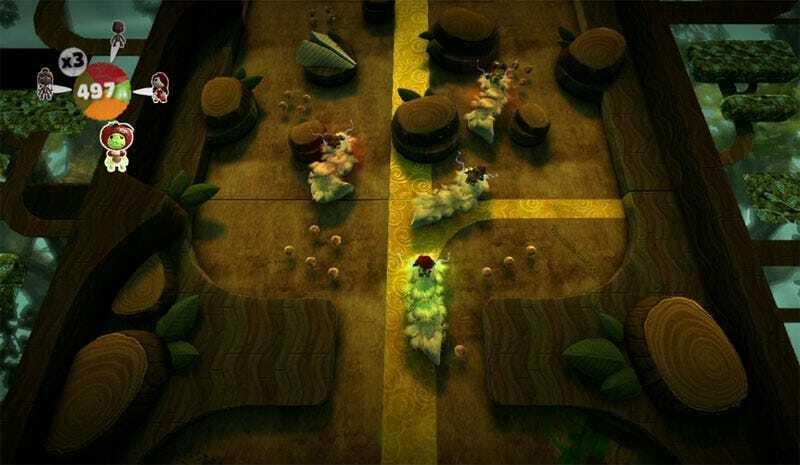 That tool, Evans says, has helped LittleBigPlanet level designers create much faster than the methods used in the original game, a more efficient replacement for switches and levers. Of course, LittleBigPlanet 2's sequencer can be used for its intended purpose: to make songs. Evans accessed the sequencer from a Sackboy's pop-it menu and threw together a quick tune comprised of honkytonk piano, beatbox kicks and snares. It was "Twinkle, Twinkle Little Star" with some erratic beatboxing layered on top. Evans then added an effect to a block, making it switch from a safe wooden material to a dangerous molten brick, then back again. All he had to do was tie that danger cue to the sequencer timeline, further illustrating how powerful that tool can be in creating levels. If you found the time investment required to craft a level or cinematic or custom game in the original LittleBigPlanet not worth the reward, it might be worth taking another look at LittleBigPlanet 2. It's due to hit the PlayStation 3 in North America and Europe this November.